In the country, August means one thing, well, maybe two: Carnivals and County Fairs! As the heat radiates off the pavement, the concession stand goodies smell hypnotically intense. The sizzling and sputtering of deep fryers churn out batch after batch of fried desserts onto white paper plates. As a child, deep fried Oreos weren’t hitting the fair’s food scene, but I do remember fried dough. My ability to put ½ a cup of cinnamon-sugar onto the dough was skillful. After I was done garnishing my dessert, the ratio of fried dough to cinnamon-sugar was one to one. 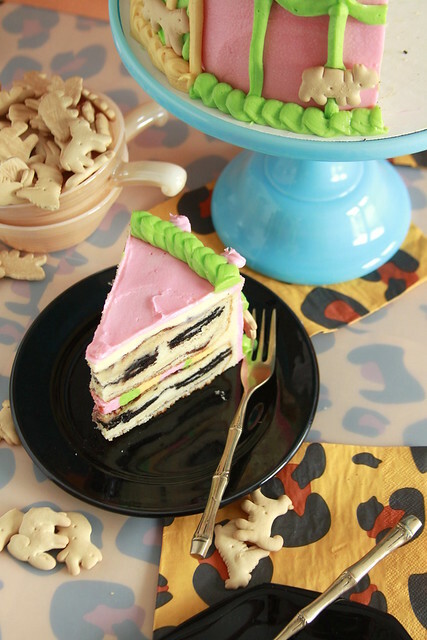 Here, layering is what gives this Deep Fried Oreo Cake that unmistakable flavor. The vanilla cake batter is thick and clings to the Oreos, the same way a fry batter would cling to the Oreo at the fair. Thin layers of cinnamon-sugar then churns up the taste of fried dough smothered in cinnamon-sugar toppings. I did a basic cream cheese frosting, but this Deep Fried Oreo Cake pairs wonderfully with American Buttercream or Swiss Meringue Buttercream as well. Inspiration came from old advertisements for cake mixes. 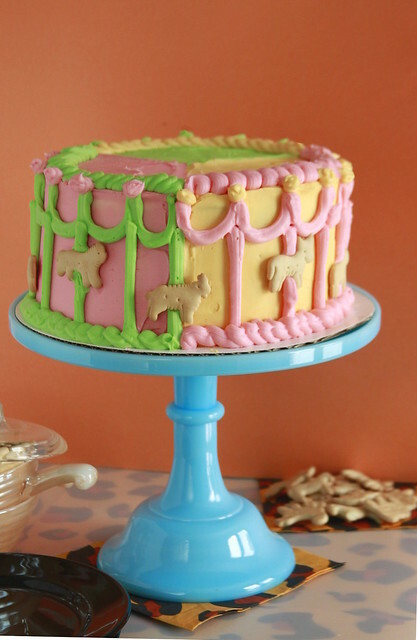 I committed to a pastel tricolor pattern both inside and outside of the cake. Prepare for the county fair with this Deep Fried Oreo Cake! It pairs perfectly with aged carousel lights and warm summer nights! Preheat oven to 350 degrees F. Spray two 8-inch cake pans with baking spray, set aside. Sift flours, sugar, baking powder, and salt into bowl of stand mixer. Fit mixer with paddle attachment and pulse mixer for 10 to 15 seconds to mix the dry ingredients. With mixer on low speed, add butter a few cubes at a time, followed by vegetable oil, beating on low until mixture looks like wet sand. Try off mixer, scrape bowl and paddle. In a spouted bowl or large measuring cup, whisk eggs, egg yolks, sour cream, buttermilk, and vanilla. Turn mixer back on low, add ½ of wet mixture and beat for 1 minute on a medium speed. Beat in remaining wet mixture, mixing for another 1 minute. Scrape bowl and paddle as needed. Whisk brown sugar and cinnamon together in a small bowl. Spoon 1⅓ cup cake batter into each pan, tapping pans against counter to spread batter. Evenly sprinkle cinnamon-sugar mixture. Spoon 1 cup batter on top, tapping against counter and using a spatula to spread without mixing cinnamon-sugar layer. Place whole Oreos onto next layer, breaking up Oreos as you get to center. Fill in exposed spots with ground Oreos. Divide remaining batter between pans, spreading to even out. 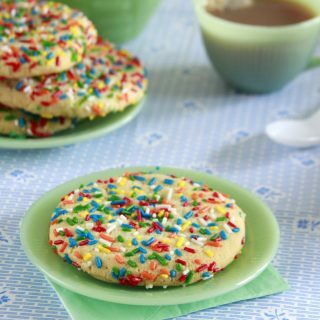 Sprinkle with remaining cinnamon-sugar. Bake for 45 to 50 minutes, rotating halfway. 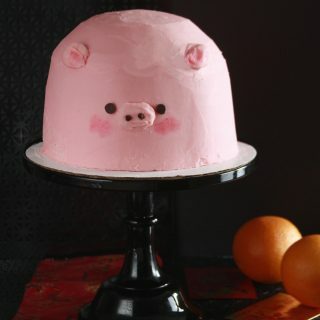 The cake layers should be brown around edges and a toothpick should come out clean with a few moist crumbs. 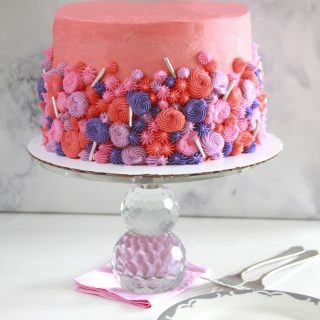 Let cakes cool in pans for 5 minutes before inverting onto a wire rack to cool completely. In the bowl of a stand mixer fitted with a paddle attachment, beat butter and cream cheese on medium-high speed until fluffy and pale in color, about 3 minutes. Scrape the sides and bottom of the bowl. Add powdered sugar, followed by cream, vanilla, and salt. Raise speed to high and beat for 2 to 3 minutes. 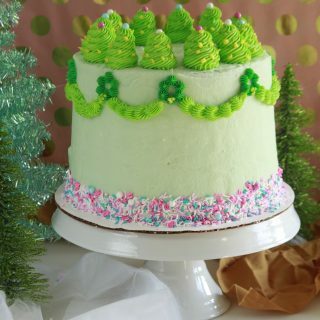 Divide frosting into 4 batches, keeping one batch plain and tinting the remaining three pink, creamy yellow, and green. Refrigerate until ready to use. Fill pastry bags with colored frosting. Secure first cake layer onto cake board. Pipe rings of frosting onto layer, alternating colors. Base ice cake with white buttercream, refrigerate for 15 minutes. 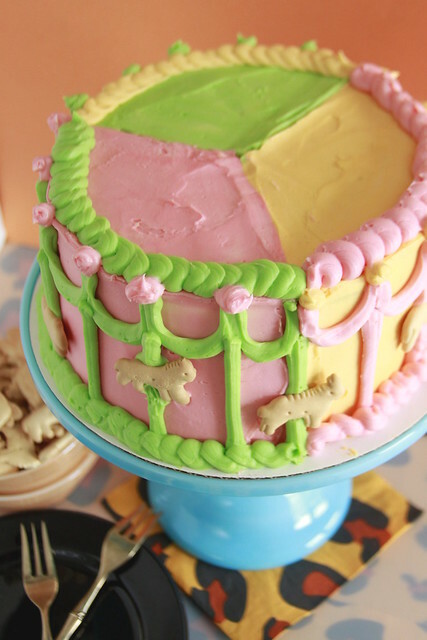 Draw a division of three sections onto cake and fill in with colors. Pipe with alternating colors, smoothing out frosting. 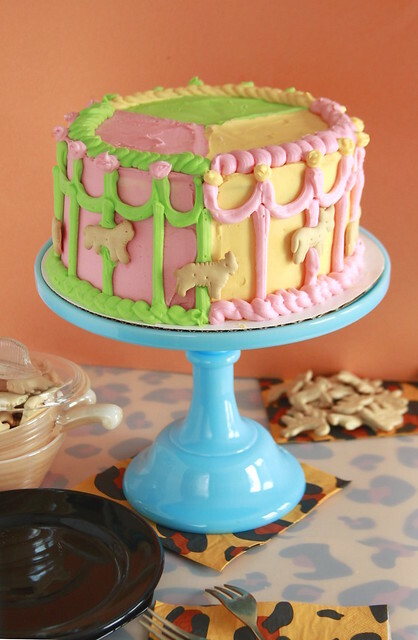 Garnish with animal crackers.